I had a chance to sit down and play with TiltaFun this morning, and I have to say, it’s rather fun. 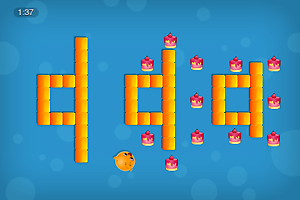 In the same vein as Snake Game, or PacMan for that matter, it’s like a next-generation Eat-This-Stuff game using the motion sensor in your iPhone to maneuver your (Unnamed) little orange ball monster around deadly blocks (as the game instructions say, they’re not quite sure why the blocks are lethal, research is pending). 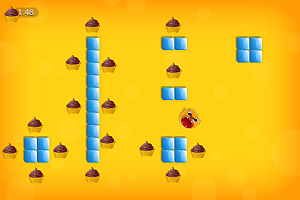 When the game starts only the first Level is unlocked, Cupcakes. There are 5 maps per level, giving this game 50 total Maps. 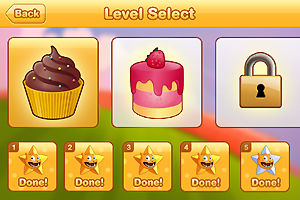 Obviously the difficultly level increases with each Level. Once you complete a map you can always return, however I found that if I failed the map after returning to a lower level, my higher Levels re-locked, a very unpleasant glitch. For further amusement I took it upon myself to say “Nom” every time my little guy ate something, and in the process giggling myself silly into a block, and dying. I never once had a problem with the sensor reading even the slightest movements, sometimes to my unskilled detriment. The graphics are fantastic, cartoony and very polished. 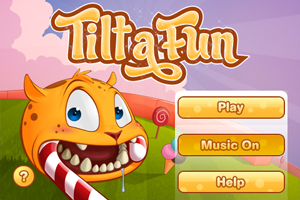 The game is simple enough to appeal to both kids and adults alike, and is the sort of game that if it were created as an online casual game would be extremely popular, but is very much created specifically for iPhone (and iPod Touch) users. The HD Trailer released, which can be seen in our earlier post about TiltaFun’s Launch, gives a very accurate idea of game play. Although might mislead you on how you hold your iPhone while playing, which is flat, parallel to the ground. Further info available on TiltaFun.com or on the iTunes App store. The cost for this game is only $1.99 – and in my opinion, absolutely worth it!